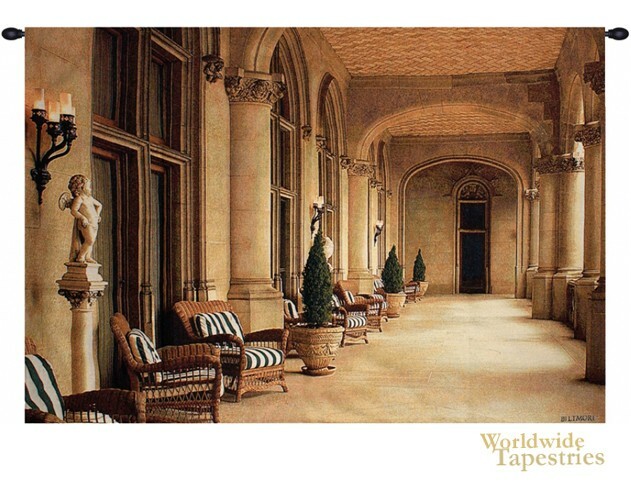 In this tapestry we see an exotic loggia or corridor, from the artwork of Biltmore Estate. The classicism of this loggia is evident with the ornate columns and statues of chreubs. The word loggia refers to the architectural feature originally from the Minoan civilization from Crete, where the gallery or corridor feature columns to interface the building to the outside. The use of color is clever in that the beiges provide a welcoming feel, and is echoed throughout the building as well as the furniture. This tapestry "The Loggia" is backed with lining and a tunnel for easy hanging. Note: tapestry rod and tassels, where pictured, are purchased separately. Dimensions: W 70" x H 47"